This scarf caught my eye...because it reminded me of a kimono I owned when I was a kid. My father had taken my sister and me on a trip to New York City in 1974. I "remember" the year because we saw The Little Prince at the Radio City Music Hall. I was a bit disappointed, having read the book, but back to the kimono...we went to Chinatown. My sister chose a far more sophisticated design, but my kimono was this same bright blue. 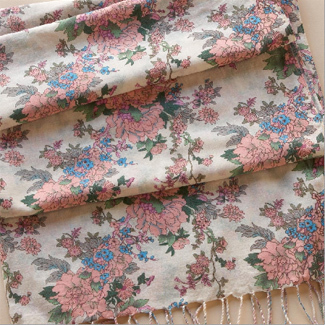 The scarf even features a chrysanthemum pattern. I'm sentimental, but not to the point of acquiring something I can't use. Hmm. The image doesn't quite capture the pink scarf's delicate beauty. This is from Fashion for Nerds, and I'd been meaning to try these techniques. The pink scarf is sufficiently long for technique #1, if you wrap the scarf only once. You get a somewhat different effect: less scarf-piling in front, longer tails--but it works. Love the tutorial btw. This image, likewise, is not very good. The charm of this skirt lies within its multitude of tiny pleats, and the untucked-in top obscures this. I have the black version, and they crank out new colors every year...which I like.